I was born in Edinburgh in 1964. I was schooled in Fife then studied at the Edinburgh College of Art. While there I won the John Kinross Scholarship, from the Royal Scottish Academy, which allowed me to study in Florence, and the Richard Ford Award, from the Royal Academy in London, to study the works in the Prado, Madrid. Early influences include the collection of Scottish Colourists and post war expressionist paintings found in my home town of Kirkcaldy's Museum. 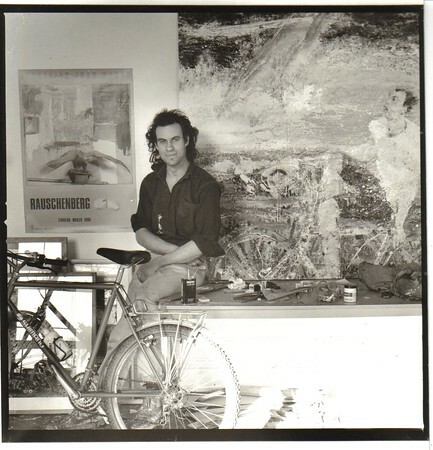 As a student I travelled by bicycle to see collections in Amsterdam, Arnhem, Paris and London. Post graduation, I won an Andrew Grant Scholarship which introduced me first hand to American art. Wyeth, Pollock, Lichtenstein and Warhol. In 1989 I won the inaugural British Airways Most Promising Artist Award. This award allowed me to travel and exhibit worldwide for the first time. These experiences have largely influenced what and how I have painted ever since. I'm a serial cabin, folly and woodpile builder. I've restored an Orcadian croft, Edinburgh New Town apartments and Victorian conservatories, I've also rebuilt a vintage car and tractor. In 2011 I rode my bicycle 4300 miles across America. It would be foolish not to include these as influences too.